The report shows that the graduate-to-job ratio of 27 in the period 2014-16 tripled from the figure of nine in 2011-13. There were 27 graduates vying for every new job in India at the end of financial year 2016, a study by JM Financial has shown, putting a number to the increasingly grim employment situation in the country. The report shows that the graduate-to-job ratio of 27 in the period 2014-16 tripled from the figure of nine in 2011-13. Private sector job creation is likely to have fallen to 100,000 in 2016 from ten times that number four years earlier. Analysts at the brokerage trawled through data from multiple sources to surmise that gap between demand for labour (jobs) and its supply (young people with higher degrees) has consistently widened over the last few years. 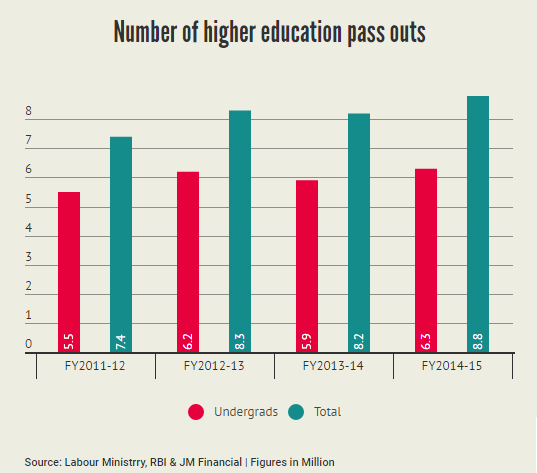 The data cited in the study shows that while India produced 8.8 million graduates in FY16, a mere 0.19 million jobs (excluding banks) were created in the first nine months of the same fiscal. 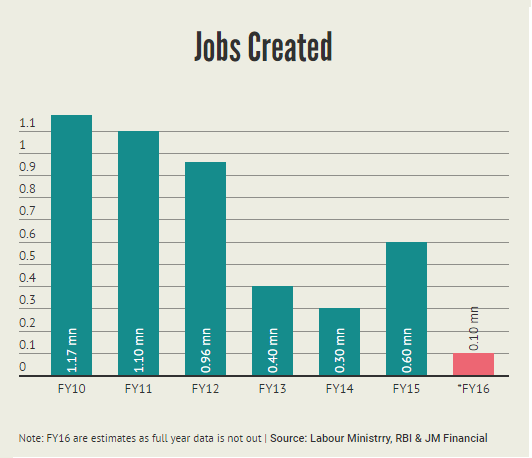 Based on the quarterly employment survey and RBI’s data on banking employment, nine labour intensive sectors created 2.5 million jobs in three-year period FY11-13. These nine sectors contribute to over 65 percent of the GDP in that period, while 22.7 million people earned higher education degrees in the same period (a ratio of 9 students per new job created). In the following three year-period FY13-16, this ratio hit 27. The figures in the study will make worrying reading for the Modi government, for whom job creation has been the single biggest challenge in an otherwise fairly rosy economic story. 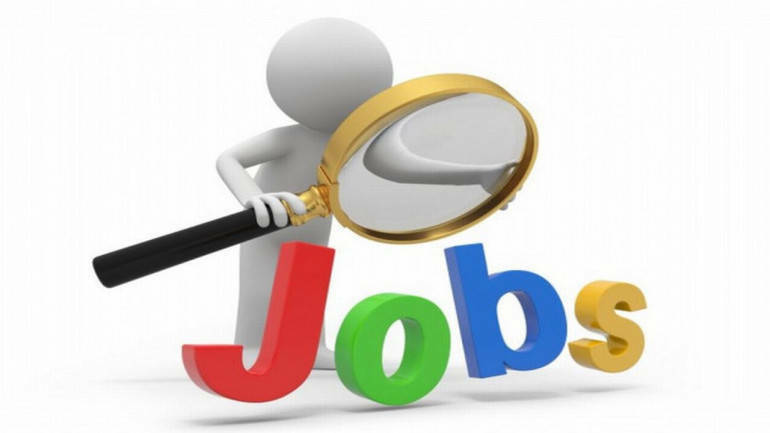 Worsening the employment picture is the fact that three key sectors, IT & BPO, textiles and banks, which have contributed to over 90 percent of these new jobs are now beginning to show signs of a pronounced slowdown. Also, because of increasing automation, the direct correlation between growth in revenues and hiring has almost halved. So, if the industry’s revenue growth was at 10 percent, jobs grew in equal proportion till a few years ago. Now, this correlation is down to half. Since 2000, these three sectors along with real estate have been the mainstay of private sector jobs in India. But with growth slowing and private investments drying up, job creation has also slowed materially. Banking too has seen a significant slowdown in new job creation for several reasons. While some public sector banks are hobbled by bad debt, low growth and deployment of technology has also played its part in restricting job growth. The risk of automation is not only in sectors such as IT and BPO, even rural India’s agri produce processing units are now using technology to automate processes, which has resulted in lower employment. JM Financial sees three possible scenarios playing out as a result of the rising gap between demand and supply of jobs. First, the brokerage expects increased outsourcing in the services sector to benefit flexi-staffing companies. Secondly, increased availability of credit to the SME sector could result in self-employment. And, along with the continued migration from agriculture, this could temper inflationary pressures. But the slowing of job creation is a reality and it needs a holistic approach rather than a piecemeal one.